Maths is an important subject in a child's basics year even before they start their foundation. Most often it is the mom who sits with her child to teach them the basics of Maths. In their KS1, knowing the number bonds, doubling and halving numbers and basics numbers functions along with number problems forms an integral part of their learning. Teaching maths to my kids who are in reception and Year 2 made me revise my basics and even come up with my own tricks of using my maths skills to come up with a precise answer. And I hope sharing these tips both of what I had seen using in school as well as my own tips will definitely come in handy to all parents who look for some help with their child's KS1 learning. 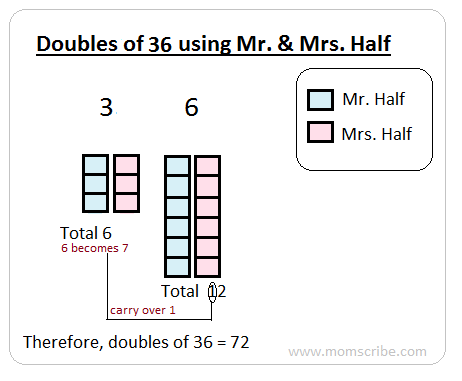 Mr. and Mrs. Half : This method is quite popular in schools. 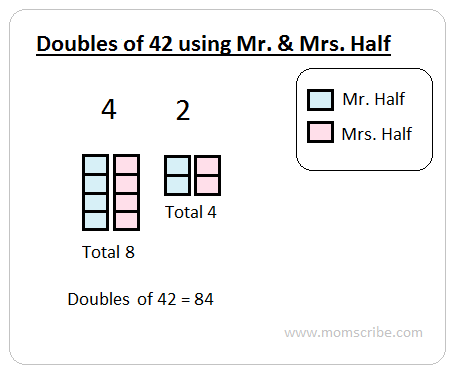 For any two digit numbers, we have to draw equal number of squares such as Mr. & Mrs. Half. Then, you have to count them together under the tens and units place to get the required doubles. If there are carry overs, just add them to the tens place for getting the doubles. 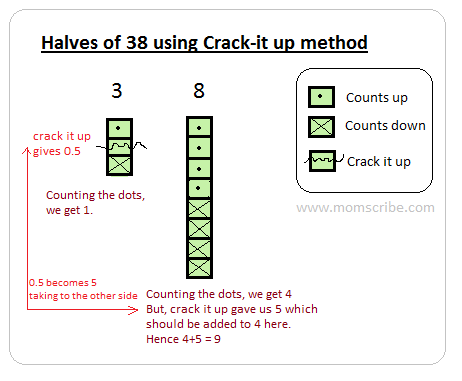 Crack it up method - Place square bars equal to the given number. We have three bars under the number 3 and eight bars under the number eight. Now, place dots and cross simultaneously such as one dot should equal to one cross. By this, we are eliminating the crosses and counting only the dots gives us the exact halves. But sometimes, for odd numbers we are left with a bar with neither uses dots or crosses. In this case, we crack the bar into half (0.5) to make them equal on both sides. This when taken from tens place is added to ones place as 5 to get the correct halves. 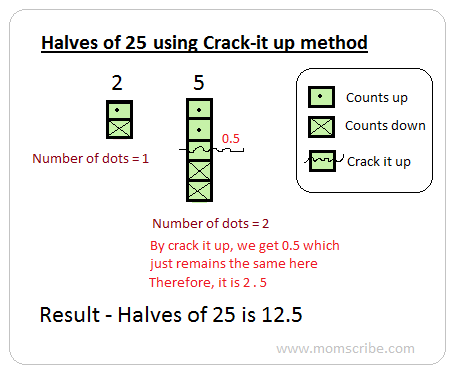 Note: Normally schools teach using number facts or division for halving numbers.While trying to use the number bonds, I accidentally derived upon the above "crack-it up method" and thus shared what I know to those who are interested in learning yet another method in solving a problem. Great idea..I think this would really work..
its really a nice idea that u have found ! Tomsreni,the method is same for 70 as well. For the 7 (in tens place) we would have 3 dots , 3 crosses and one crack (which passes to unit place as 5). So, the unit becomes, 0+5 = 5. 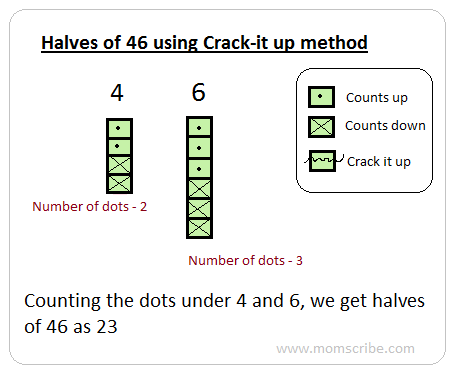 So answer is now 3 (counting dots in tens place) | 5 (units place) = 35.